Elmer Crowell of Massachusetts carved this merganser pair. 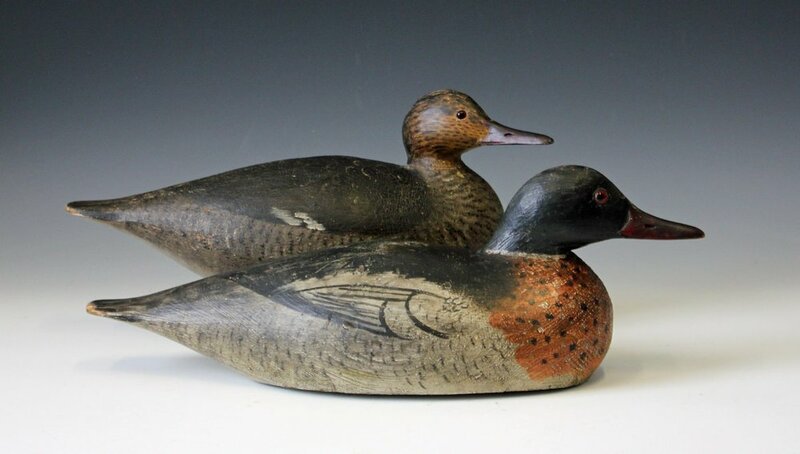 A new exhibit featuring antique decoys will open this weekend at the Ward Museum of Waterfowl Art in Salisbury. "50 Finest Decoy Makers Before 1950,” the new exhibit at the museum’s LeMay Gallery, opens to the public during the Chesapeake Wildfowl Expo, as the Ward Foundation celebrates its 50th Anniversary. The exhibit brings together a wide assortment of antique carved decoys from the Eastern Shores of Maryland and Virginia to the Upper Midwest and Great Lakes region to the West Coast. Each maker in the exhibit was nominated by decoy collectors across the country, emphasizing the strong connection between the Ward Museum and the decoy-collecting community. The exhibit’s grand opening will be Friday, October 12 at the 50th Anniversary Golden Goose Reception. It will run through February 17, 2019. For more information about the 50th Anniversary celebration and the Wildfowl Expo, click here.